When you are buying a new property or looking to sell one, there a lot of elements to consider, ranging from the price and location to the facilities and condition. Often, we look at the big issues with a property, such as a history of subsidence or movement. But there is another problem that can be more subtle yet have a huge impact on the process – the presence of damp. There is often the temptation to overlook problems that you consider to be minor, when you want to sell your home. A little damp in one wall of a room or in a room you don’t often use, might seem to be a minor issue that a spot of fresh paint can fix but really it isn’t. Damp never just appears without reason and in many cases, the damp proof course of the house will be to blame. If the property is old, it may have deteriorated, been bridged or perhaps is missing entirely, rendering the house vulnerable to much bigger problems. Although you have learnt to live with damp, it is something that a surveyor will notice immediately and recommend should be eradicated as a priority. Preparing your home for sale should always include checking for any signs of damp. It helps to know where to look, so that you know where the problems are and get help before the house goes on the market. 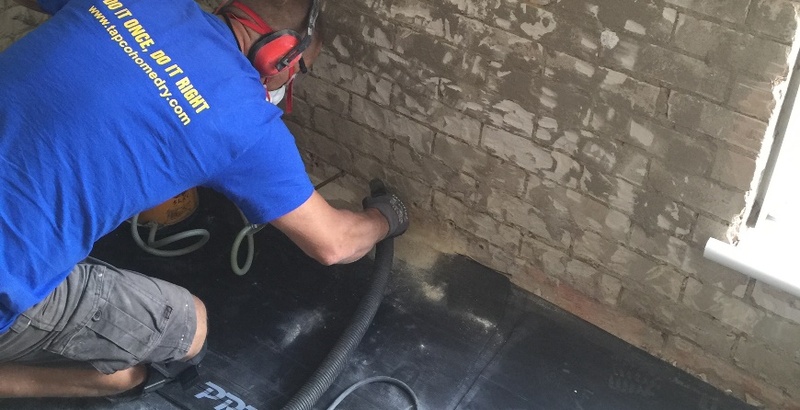 A damp proofing specialist, such as Tapco HomeDry, will be able to carry out a damp survey and check for the signs and causes of damp as well as providing solutions to eradicate them. While spending the money might seem counter-intuitive when selling, if a buyers surveyor finds damp, then the whole sale could fall through or the revised offer will be far in excess of what the remedial work would cost..
A poll in 2014 found that almost one-third of sellers had concealed a defect in a property when it was up for sale and one of the most common problems to be hidden, was damp. Often people don’t do it maliciously but simply do it for decorative reasons, not realising how serious the problems of damp can be. There are often signs you can see outside that might indicate a problem with internal damp or other similar issues. For example, you can’t see a damp proof course, normally a thin black line in the brick mortar, a short distance above ground level. You might see signs of water damage such as a very wet wall, moss growth or general staining on walls, this is a sign that the property has possibly got damp. if you see the signs of damp don’t let it put you off buying the property, Tapco HomeDry have all the solutions to eradicate the problems. Remember damp problems can be eradicated and if you don’t do it, someone else will. In most cases a price reduction can be negotiated to cover the cost of the work, so it is very important to have the property surveyed before you exchange contracts. Because damp can lead to conditions that affect the health of the occupants of the property, landlords have even more of an obligation to deal with the issues. If a tenant reports damp in the property they are renting, it is important that you take immediate action to limit the risk of your tenants health, damage to their clothes and belongings, as well as your investment. Tapco HomeDry work with many of London and the Home Counties landlords, property management companies and letting agents and have vast experience at working in rental properties. Our dedicated team will carry out every aspect of the damp eradication and will liaise with you tenant throughout.